I’ve just been watching this Ted Talk about introverts. Susan Cain rightly distinguishes introverts compared to being shy. One is a character type, another is a fear of social judgement. But this issue comes up a lot in daygame and anything else designed for the extrovert (at least on the face of it). 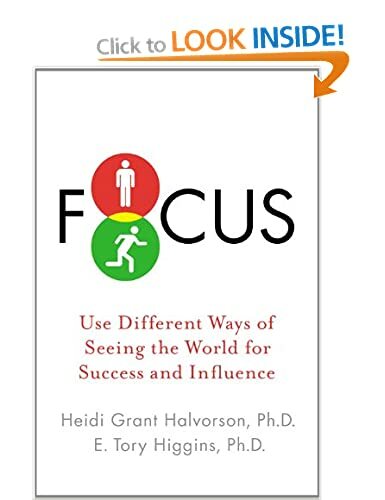 This is an excellent book called Focus. It is the most balanced book I’ve read about introverts and extroverts (more broadly labelled as “prevention oriented / promotion oriented”) and points out (with evidence) the place and use of both types of people. So while the USA as a collective consciousness espouses the promotion mindset (act now, ask questions later, reach for the stars, live the dream, try and fail, if at first you don’t succeed, go for broke, you can do it, believe and it will happen) it could often do with balancing this out, as we have learned to the world’s cost for example from going into a 10 year “war on terror” without a plan (costing untold death and human suffering), or allowing the crash of the world economy because they just didn’t think it through. Now, personally, I would say that I am equal parts extrovert and introvert – my love of showing off is colossal, but so is my desire to be alone and in my thoughts. Sometimes I’ll be out with friends or at a party and love it – talking to everyone, joking around, having fun, flirting… but sometimes I’ll be at an event and desperately want to go home and sit with a book, watch some videos or mediate. Why? Because I want to, and at that moment that’s where my desire lies. Some people are out on the streets, or in bars/clubs etc. and think are thinking “I’m not good enough, why should people be interested in me… I have nothing to offer to that girl” – this is shyness talking, don’t confuse it with the other limiting belief “I’m an introvert”. But “I don’t want to dance like a monkey in front of that girl – it’s not me”. That’s an introvert and introverts like everyone else should not hide who they are. And by “should not” I mean if they do hide themselves, they will feel unhappy. But here’s the thing – when I started daygame it was often a drag, I felt really bad out there, many times. Why? Because my head was full of limiting beliefs – “she’s too busy, she’s got more important things to do, I’m not important enough to stop her.” This was my shyness, not my introversion. Overcoming these beliefs was well worth it and I knew it at the time – it helped me be more my naturally extroverted self. However, to do this day, I’m sometimes out and I realise that I would love right now to be working on my music – alone, on my own, in my room – this would give me the most satisfaction. So I’ll leave, come home and do just that. You can see the difference between the two and the question is “what would bring you more fulfillment?”. If going home and working on something you love is the answer, do that. If it’s overcoming your nerves and getting out of your head, then stay out! So unapologetically be an introvert if you are one. Not out of fear, but out of love. Just don’t be shy if you don’t want to be. Challenging yourself and expanding and growing yourself is fine. But fighting every fiber of your own being? Why bother?